The Phillies handed out one of the biggest bonuses since the end of the 2008 international signing period, signing Dominican outfielder Domingo Santana for $330,000. Santana is a 6-foot-5 righthanded hitter with a plus arm in right field. He’s an average runner with a long, projectable frame and is still learning to adjust to breaking balls. Santana has been eligible to sign since August, when he turned 16. The signing marks Philadelphia’s largest international signing bonus expenditure within the last year. Santana got his first taste of professional ball in the GCL. Career Synopsis: Shortly after signing, Santana made his professional debut with the GCL Phillies at the tender age of 16. He was quite impressive given his age, as he posted a .288/.388/.508 line, walking at an 11% rate and homering once every 23 at-bats. On the downside, he struck out at a prodigious rate (32%). 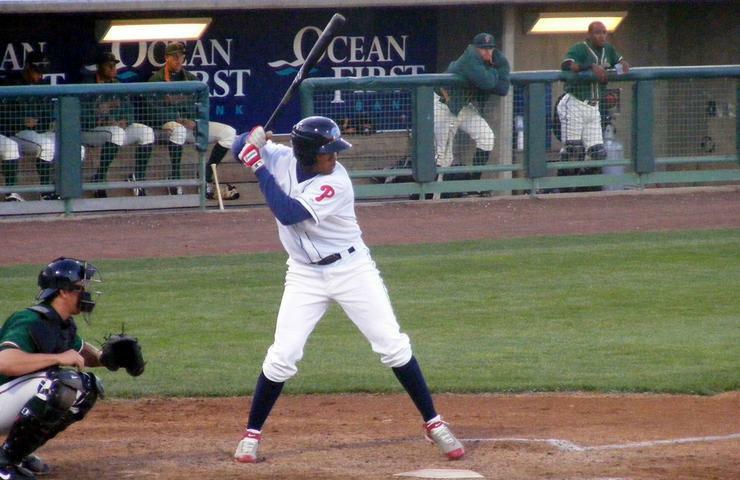 Following the season, Santana participated in the Florida Instructional League. Heading into 2010, Santana was rocketing up the prospect ranking lists, appearing at #10 in Baseball America, #7 by John Sickels, and #9 by Baseball Prospectus. The Phillies aggressively pushed the 17-year old to Lakewood where Santana was completely overmatched. While he did draw walks at an outstanding rate (14%), it was hard to take many other positives out of his stint in the SAL. By the time he was sent down to the NYPL in mid-June, he had posted a .182/.322/.297 line, striking out in 38% of his PAs, and homering only once every 67 PAs. In almost exactly the same number of PAs after being demoted, he improved across the board (albeit very slightly) with a .237/.336/.366 line, homering once every 44 PAs and striking out at a 34% rate. His walk rate in the NYPL dropped as well, but at 11% was still quite good for a 17-year old in that league. Santana again participated in the FIL after the season. Despite a rough 2010, Santana’s prospect status remained generally unblemished as Baseball America ranked him #9, John Sickels #8, and Baseball Prospectus #15. Summary: Santana has massive upside, and all of his tool ratings have to be taken with a grain of salt, as he is still young and incredibly raw. His power will be his calling card, and because he’s struggled to make consistent contact so far, its tough to project him as anything more than an average hitter right now. That could change, of course. He has a very strong arm, and should profile well in right field. Upside: Santana is a scout’s dream with size, power, speed, and a very strong throwing arm. It’s quite difficult to judge performance to date, as he has not simply been young for the levels he’s played at, he’s been exceptionally young. Assuming he tries Lakewood again this year, he’ll still be young for that level. Hopes for Santana really depend on how much of an age-based mea culpa he gets for 2010. Santana’s ability to draw a walk and his willingness to work a count at his age is perhaps his most developed skill, while his inability to hit breaking pitches of any sort is his least-refined. Comparisons have ranged from Jermaine Dye to Vladimir Guerrero to Sammy Sosa. While Santana will still be young for the SAL this season, he definitely needs to show more than he did last year or risk having a lot of additional question marks attached to him.